When it comes to correcting your child's misbehavior, there’s a big difference between punishment and discipline. While punishment focuses on making a child suffer for breaking the rules, discipline is about teaching him how to make a better choice next time. Punishment instills a penalty for a child’s offense. It's about making a child "pay" for his mistakes. Sometimes, the desire to inflict punishment stems from a parent’s feelings of frustration. At other times, it stems from desperation. 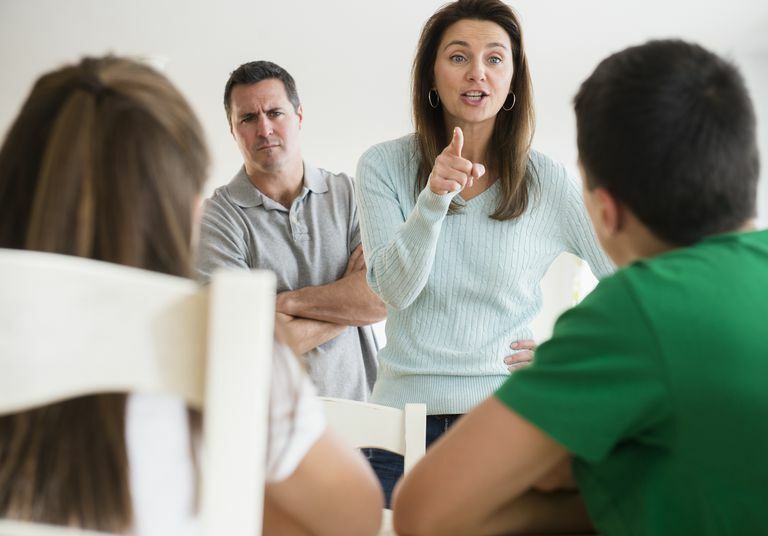 A parent may feel compelled to yell, spank, or remove every privilege a child has ever had in an effort to send a clear message that his behavior better change "or else." Punishment is about controlling a child, rather than teaching the child how to control himself. And most often, punishment changes the way a child thinks about himself. A child who endures serious punishment may begin to think, "I'm bad." Instead of thinking he made a bad choice, he may believe he's a bad person. Authoritarian parents are most likely to punish kids. Punishment, like a spanking, is meant to inflict physical pain and suffering. Other examples of punishment may include forcing a teenager to hold a sign that says, "I steal from stores," or calling a child names. Punishments don't teach children how to behave. A child who receives a spanking for hitting his brother doesn't learn how to resolve conflict peacefully. Instead, he'll be left feeling confused about why it's OK for you to hit him but it's not OK for him to hit his brother. Punishment also teaches kids that they are not able to be in control of themselves. They learn their parents must manage their behavior because they are not able to do it on their own. Harsh punishment can cause kids to dwell on their anger toward the person inflicting the pain, rather than the reason they got in trouble. So rather than sit and reflect on how he can do better next time, a child who is forced to sit in the corner for hours may spend his time thinking about how to get revenge on the caregiver who put him there. Discipline teaches children new skills, such as how to manage their behavior, solve problems, and deal with uncomfortable emotions. Discipline helps kids learn from their mistakes and teaches them socially appropriate ways to deal with emotions, like anger and disappointment. Discipline techniques include strategies such as time-out or the removal of privileges. The goal is to give kids a clear negative consequence that will help him make a better decision in the future. Discipline takes an authoritative approach. Healthy discipline involves giving kids clear rules and consistent negative consequences when they break the rules. Consequences are also time sensitive. So while punishment may involve a parent removing all electronics indefinitely, discipline might involve taking away the TV for 24 hours when a child refuses to turn it off. Discipline is proactive, rather than reactive. It prevents many behavior problems and it ensures kids are actively learning from their mistakes. Many discipline techniques involve positive approaches, such as praise and reward systems. Positive reinforcement encourages good behavior to continue and provides kids with clear incentives to follow the rules. Discipline also fosters positive relationships between parent and kids. And quite often, that positive relationship reduces attention-seeking behavior and motivates kids to behave. While discipline allows for appropriate amounts of guilt, it isn't about shaming kids. And that is crucial. A child who feels good about himself is less likely to make poor choices. Instead, he'll have confidence in his ability to manage his behavior. PTA, PTSA or PTO - What is the Difference?